With a 2-1 record clashing with a 3-0 record, this Eurocup Group D is sure to be an exciting affair. Both teams will know the importance of grabbing a win in this game, so we should see end-to-end basketball and a lot of basketball betting opportunities. The head to head record sees these teams stand at 1-1, which comes from the 2013/14 season, so there isn’t much to split these teams. With two wins behind them already and a home game this week, there is no reason for the team from Ulm to be concerned or overly nervous about their form. There is a good chance that if Chris Babb performs well for the hosts, they will be feeling good about themselves at the end of the game. This is because Babb has delivered an average of 14 points per game this season, which is a big factor in their success to date. He has been based by Raymar Morgan who has managed to provide an average of 11.7 points per game and if these players click on Wednesday, the home fans will be delighted. For the Israeli side, you cannot argue with three wins out of three and they will be desperate to bank another win in this clash. It stands to reason that there have been a number of big players for the Israelis so far this campaign but the form of Curtis Jerrells has been hugely impressive with an average of 19 points per game at this stage of the season. There has also been support from Tarence Kinsey, with an average of 14 points per game and Jerome Dyson, with an average of 13 points per game. 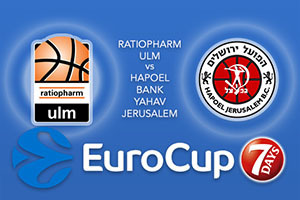 The side from Jerusalem has the firepower to take the points in this Eurocup clash. It could be a close affair but you have to look at Hapoel Bank Yahav Jerusalem at -2.5 which is provided at odds of 1.90. For the Over/Under market, look to go UNDER 170.5 available at odds of 1.90. Bet Now!